You can use the options on the Excel 2016’s Paste button’s drop-down menu or use the options in the Paste Special dialog box (by choosing Paste Special from this drop-down menu or pressing Alt+HVS) to control what information is pasted into the paste range. Normally, when you paste worksheet data from the Clipboard, Excel 2016 pastes all the information (entries, formatting, and comments) from the cell selection into the designated paste area, thus replacing any existing entries in the cells that are overlaid. The paste options in the Paste Special dialog box give you control over how a cell selection on the Clipboard is pasted into your worksheet. The options in the Paste Special dialog box are divided into two areas: Paste and Operation. The Paste option buttons (some of which duplicate the options on the drop-down menu on the Ribbon and the Paste Option’s palette in the worksheet) enable you to specify which components of the copied cell selection you want copied; see the table for a list of options. 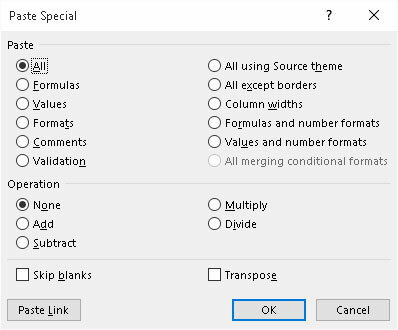 The Operation option buttons in the Paste Special dialog box enable you to specify which mathematical operation, if any, should be performed between the overlaying values in copy and paste ranges. Select the Skip Blanks check box when you don’t want Excel to replace existing entries in the paste range with overlaying blank cells in the copy range. The Transpose option, which appears on the Paste button’s drop-down menu and the Paste Options button (also duplicated by the Transpose check box in the Paste Special dialog box), is particularly helpful when you have a row of column headings that you want to convert into a column of row headings or when you have a column of row headings that you want to convert into a row of column headings. You can also use this option to pivot an entire table of data so that the data that runs across the rows now runs down the columns, and vice versa. The following figure illustrates just such a situation. Here, the production schedule table (including the column headings) is selected in the cell range A2:J6, the Copy button on the Home tab of the Ribbon is clicked, and the cell cursor is moved to cell A8. After that, choose the Transpose option from the Paste button’s drop-down menu. Excel’s Live Preview feature then shows how this transposition would appear in the cell range A8:E17. Transposing a copy of the production schedule table so that dates now form the row headings and the part numbers now form the column headings. In the transposed table, the original row headings are now the column headings just as the original column headings are now the row headings. 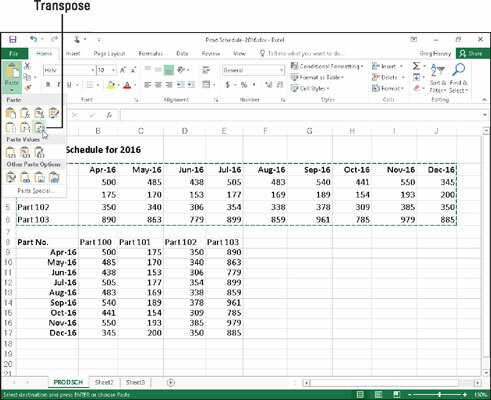 Note, too, that in transposing the table, Excel retained the formulas that total the units produced each month, although now they appear in the last column of the table instead of the last row. To convert a cell range that contains formulas to its calculated values (as though you had input them as numbers), select the cell range, click the Copy button on the Home tab, and then choose the Paste Values option from the Paste button’s drop-down menu without moving the cell cursor. This causes Excel to paste the calculated values on top of the formulas that created them, thus zapping the overlaid formulas and leaving you with only the computed values!